Names? You want 'em? This weekend's got em, with a couple of absolutely packed casts, albeit with mostly B- and C-List actors, for a couple of pretty-strong-for-September comedies, along with a early take on a Halloween theme. It's a bit of an early start for what promises to be an unusually strong October slate of franchises and awards bait films. Tiffany Haddish is definitely having her Melissa McCarthy moment. After a minor breakthrough with Keanu, last year's Girls Trip vaulted her into, if not superstardom, at least the kind of fame that can headline and launch a great big comedy. 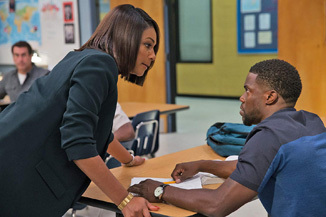 She's starring here in Night School with someone named... let me check here, Kevin Hart. ... Never heard of him. Hope he gets his shot! Haddish plays the somewhat draconian teacher of a GED class that Hart, along with several other funny people (Rob Riggle, Mary Lynn Rajskub, Romany Malco) need to pass in order to get their jobs back. Seeing as most of them are bad students and/or have various identified learning disabilities, the normal method of teaching isn't going to apply. That leads Haddish to try some ... unconventional methods, like beating up her students. This is, to put it lightly, not established pedagogy. This leads Hart and his compadres to try and steal the answers to the final test, putting us straight in comedy caper territory. Hart and Haddish make for a good comedy duo, though with two enormous comedic personas on screen, balancing their energy might be difficult. Ads for the film seem like the whole film is dialed up to 11 for most of its running time. Reviews are pretty dismal, though that may not matter to fans of Haddish and Hart, both of whom are coming off some pretty substantial hits. While I don't tend to give him a ton of credit to Hart for Jumanji, he's got a solid string of films like Ride Along and Central Intelligence. The bad reviews suggest possible weakness down the road, but for its opening weekend, it's got a similar easy to digest premise and a couple of strong gags. I'd expect a weekend of $32 million.